A man pours milk into a can in India's Mayong village in 2015. 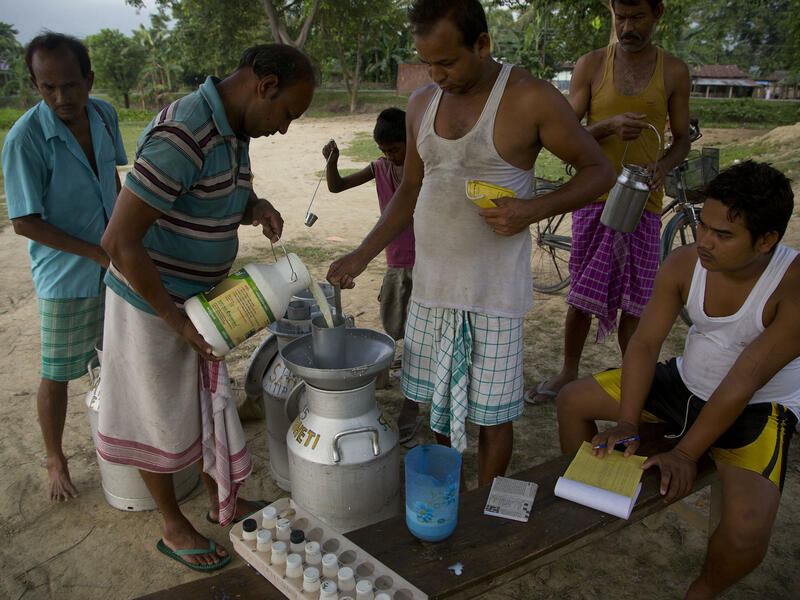 India is the world's largest producer and consumer of milk. Humans, it turns out, are unique in their preference for the dairy drink. "In nature, we aren't meant to have milk past weaning," Kurlansky says. But because of a genetic aberration, many humans can process the sugars found in milk and dairy products well into adulthood. And while that makes some of us unique among mammals, it doesn't mean that all humans have those genes. "It's still only something like 40 percent of the human population that can drink milk past the age of two," Kurlansky told NPR. The genetic change is primarily found in white, northern European populations and their descendants. And although it may be Eurocentric to say that all humans can enjoy dairy in the same way, it hasn't stopped milk from becoming a global industry. Cultures around the world consume milk from different animals and in different ways. From yak yogurt in Tibet to camel milk ice cream in Dubai, there's a lot to milk that goes beyond the gallon of 2 percent we find in our grocery stores. "Cow milk is kind of bland, and we're kind of used to bland. So if you have sheep milk or goat milk or camel milk," Kurlansky says, "it has this other dimension of flavor, which is kind of nice if it doesn't shock you." For most of human history, drinking milk was limited to the farm. Because it spoiled so quickly, most milk was turned into products like cheese and yogurt, which could last longer for transport and trading. It wasn't until about mid-19th century with the advent of pasteurization and widespread refrigeration, that milk became the ubiquitous drink we think of it as today. But milk's popularity has come with pushback. Some wonder if we are treating our milk-producing animals humanely, or if we should even be drinking milk at all. Kurlansky says farmers have to balance consumer demand for more humane and organic dairy products with government subsidies that keep prices artificially low. "Some people will pay more for milk if it's GMO-free, or if it's organic, or if it's animal-kind," he says, "but there's a catch: usually these things make milk much more expensive to produce." Faced with the choice, most consumers still go with what's cheaper. And as for whether we should even be drinking milk at all, Kurlansky says things aren't so clear. Milk can be beneficial for some — particularly those who need more calcium — but can be dangerous for others. "Blanket health proclamations are always problematic," he says. So next time you find yourself perusing the local dairy aisle, remember that milk goes beyond the black-and-white cows dotting American dairy farms. It's much more global — and more controversial — than you may have ever realized. Milk, that humdrum household staple, has been at the center of some of today's big food fights. And some of those arguments over the importance of breast feeding, the healthiness of milk, even which animals make the best milk go back thousands of years. My guest, Mark Kurlansky, calls it the most argued-over food in human history. And he covers that history in his new book, "Milk!" He joins us today from New York. Thanks so much. GARCIA-NAVARRO: So much of our nation's food is made from dairy, which is, of course, milk. But you point out that humans are the only mammals that drink milk past weaning. GARCIA-NAVARRO: You're not supposed to do that. GARCIA-NAVARRO: I know that to be true. I have a cat. GARCIA-NAVARRO: They are oddly also lactose intolerant. KURLANSKY: Well, you know, we're all supposed to be. We aren't meant to have milk past weaning. There is an enzyme called lactase, which deals with the lactose, which is a sugar that's in milk. And after a certain age in humans, about the age of 2, we stop producing it, and then we can't digest lactose. But for some reason, a genetic aberration, which took place particularly in Europe, kept the lactase so that we could keep drinking milk. This is actually not normal. And even today, even though the number of people with this condition is growing, it's still only something like 40 percent of the human population that can drink milk. GARCIA-NAVARRO: Yeah. In fact, I'm Hispanic. Our producer is of Pakistani descent, and our editor is of Vietnamese descent. And when we were talking about this book, we were all like, yeah, we're lactose intolerant. GARCIA-NAVARRO: So it made the point quite nicely. But milk has become this global food industry. How did that happen, briefly? KURLANSKY: It happened slowly. And for a very long time, very few people drank milk because, for reasons that people didn't understand, you got sick from milk if it stood around too long. You know, it was basically just people who lived on farms who drank milk, which is why it was sort of looked down upon. Like, the Romans looked down upon Northern Europeans for drinking milk because it was considered a backwards thing because where they came from, only farmers did it. And it really wasn't until 18th century that liquid milk started to become traded product. GARCIA-NAVARRO: Yeah. And then they learned how to pasteurize, obviously. KURLANSKY: One of the mysteries I solved for myself when I was researching this book is - you know, since Louis Pasteur invented pasteurization, why aren't the French more into it? KURLANSKY: And then I came to realize that Pasteur wasn't trying to pasteurize milk. He was actually trying to pasteurize wine, which seems much more French. But the process was adopted for milk. And the reason it was adopted is that infant mortality was horrendous - something like over half the deaths in cities were people under 5 years old. And they came to understand that this was from milk, and pasteurization solved that problem. GARCIA-NAVARRO: There are movements that push to make milk production more humane for the animals involved, primarily cows. There's also a push from the non-GMO, hormone-free and organic farming movements. In your opinion, what is the future of milk? KURLANSKY: Well, that is what farmers are trying to work out. Their problem is that there is a set price for milk in the U.S., fixed by the government. In different countries, like in Australia, it's fixed by supermarkets. But there seems that everywhere there's a fixed price for milk, and the price isn't nearly high enough. And you can charge more, but nobody will buy it because they can get this other lower-priced milk. But then there's all these other issues. Some people will pay more money for milk if it's GMO-free or if it's organic, but there's a catch. Usually, these things make the milk much more expensive to produce. GARCIA-NAVARRO: So, I've got a personal question for you. Your book touches on many different types of animal milk - cow, buffalo, camel, yak. What's your favorite? KURLANSKY: Ah. You know, for drinking milk - and I have to confess I'm not a big milk drinker - you know, we're kind of used to drinking cow milk. GARCIA-NAVARRO: You buried the lead there, Mark. GARCIA-NAVARRO: I have had it. KURLANSKY: Have you? Did you get it in Tibet? KURLANSKY: Yak yogurt - isn't it wonderful? GARCIA-NAVARRO: Recommendations from Mark Kurlansky. His new book is "Milk!" Thank you so much for joining us. KURLANSKY: My pleasure. Transcript provided by NPR, Copyright NPR.